I agree wholeheartedly. I believe that rewriting is the essence of good writing. I also believe rewriting is a skill that, like any skill, takes time and much practice to acquire. But I know some folks won’t agree with me, so let’s look at a few of their arguments. This can happen. Beginning writers do have the tendency to edit the soul out of their stories. I know I did. When I first began writing, rewriting was NOT my friend. I recently dug some of my earliest stories out from the shoeboxes I’ve lovingly interred them in. I write in drafts, always have, saving versions 1 to ... well, to however high it goes. For my oldest stories, my beginner stories, the first draft, perhaps even the second draft, had a sort of quirky personality. A mood was communicated. Yes, the story itself needed a lot of work, but there was something there, a spark. Then I read the versions of the story that followed and saw that spark dim and finally die. So, yes. I agree. Rewriting doesn’t necessarily make something better, sometimes it just spoils it. How can we prevent this? I believe that this is where the craft, the techne, of writing comes in. Part of the reason writers must write regularly is so we can practice rewriting. It’s also helpful to get feedback from folks who know how to spot where we’ve gone off the rails. This is especially important in the beginning. After a while we get a feel for it; this is often called developing our distinctive voice. So, yes, writing can strip a story of its soul, but that just means we need to write a lot and read a lot and solicit feedback from people whose opinion we respect, because that’s how one gets better. That’s true. Rewriting does take time. A LOT of time. Time that could be spent doing other things. And it’s true that if one wants to make a living at writing one must produce work on a schedule. If one must put out, say, a 60,000 (or greater) word book every three months then the amount of time one has for rewriting is curtailed. Some folks have a knack for writing strong prose and a gripping story in a staggeringly brief amount of time. It’s a skill, and my guess is they were pretty good storytellers to begin with. In any case, yes rewriting takes time and how fast one can put a book out can determine (at least if one isn’t a New York Times Best Seller) whether one can make a living at this. But, as I said above, learning to rewrite both well and quickly is a skill, and to hone a skill takes practice. Sometimes a LOT of practice. If you’re not there yet, don’t give up. In this case, slow and steady does win the race. Lester Dent, perhaps the most famous of the pulpateers, at times wrote over 200,000 words a month and made a nice living even during the depression era. He never rewrote and editing was left to the publisher. I’ve read some of his stories, for first drafts they are amazing. I also think that certain stories, perhaps even certain statements, are best made from the heart in one great orgasmic rush. To rewrite them wouldn’t improve them. So, to sum up, these days I do wholeheartedly, believe that for the overwhelming majority of writers, both professional and amateur, rewriting is indeed the essence of good writing. I couldn't agree more with this. I've been 100% guilty of trying to get the perfect prose into a first draft for something. I thought that maybe it would make the story sound better or come to life. I also had the problem of making the mistake of cutting way too much out of a draft that it bled the story dry. Finding a middle ground is definitely the key to great writing. I've learned that the process of rewriting can actually be fun to some degree but more than anything, it's enlightening. 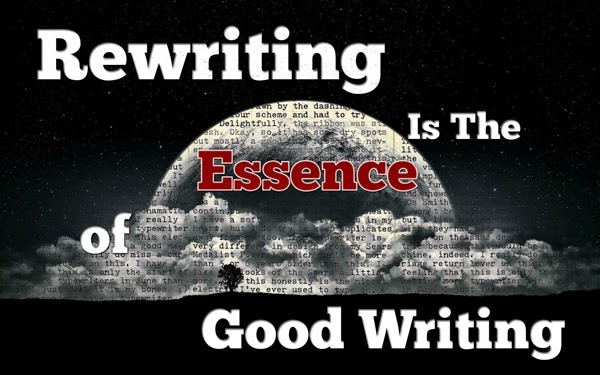 I think I agree, rewriting is the essence of good writing.